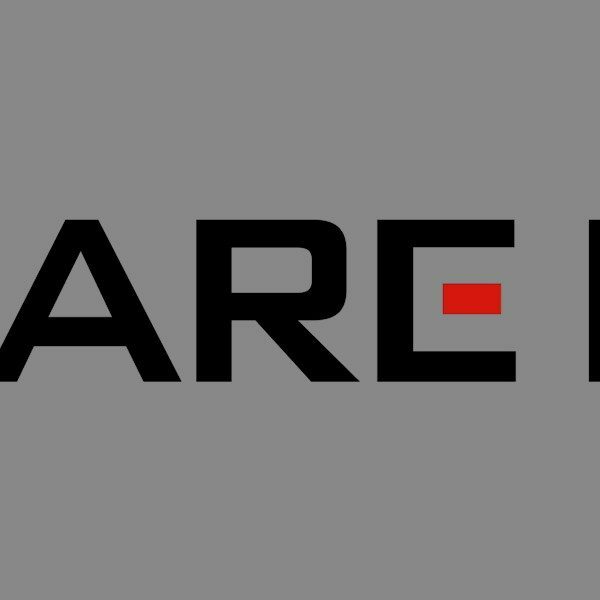 GRAVEL wasn’t the only game I got to check out when I hit up Square Enix’s offices last week. They also let me test out Monster Energy Supercross: The Official Videogame, an arcade style motocross racing game coming out next month. As I mentioned in my pervious article, I am not much for racing games, and I have even less experience with motorcycle racing games. I would like to start by saying that caused me no problems when picking up this game. It was just as accessible as GRAVEL, with its own spin. Before jumping into the competitive side of things, I took a few minutes to play with the track editor. 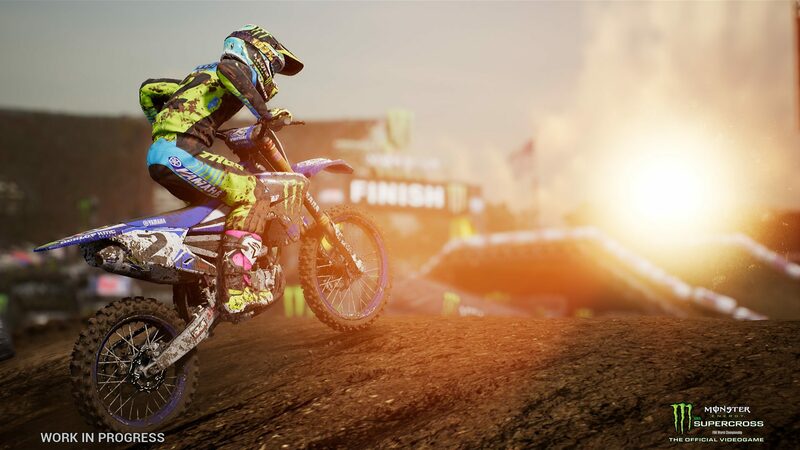 Monster Energy Supercross allows players to build their own tracks with an impressive amount of options and detail, and then test drive them to see how well things work. With turns of every shape and angle, bridges and jumps, you can wind the track over and back on itself so many times you don’t remember where you’re going when you try to test it. That’s a good thing – there is a lot of versatility to the track editor, and I can’t wait to see what people more creative than me will build with it. Players can build their tracks and then share their elaborate creations online with their friends. Once I was done missing turns on a track I built, I had a better feel for the controls and I jumped into a competitive race. 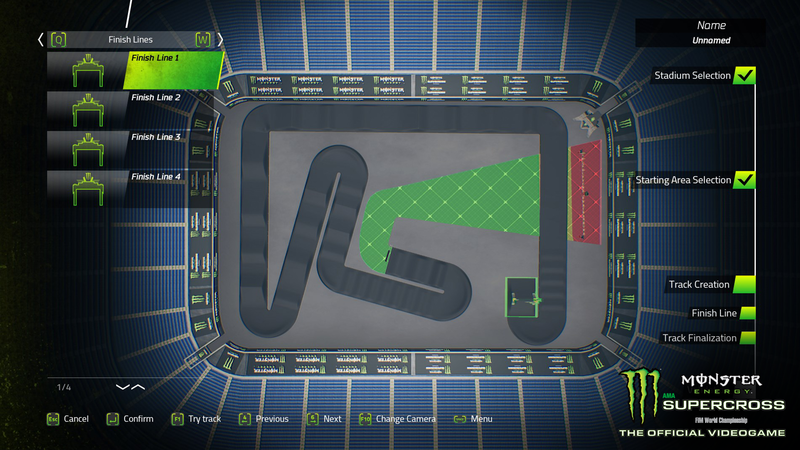 All the available races and arenas in this game follow the actual Supercross circuit. Graphically, you can tell there was a lot of focus on making this look as authentic to the real races as possible, from the arena, to the track, to the fans. 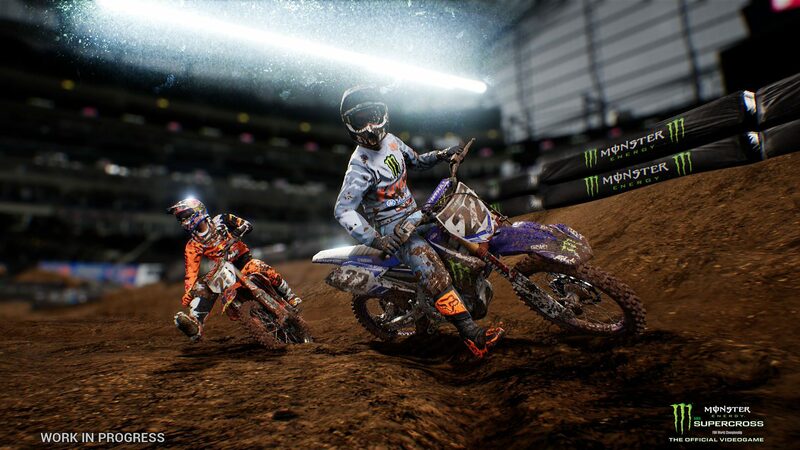 All the riders featured in the game are real Supercross stars, and the announcing for each race is being recorded by Ralph Sheheen, the voice of Monster Energy AMA Supercross. The races felt crowded in the best possible way. With all the twists and turns, I rarely felt like I was out of traffic, and I would often collide with fellow riders. While not great in the real sport, it was definitely a fun turn for the game. The physics of the bike felt smooth and realistic, without making it too difficult to land a jump. I came in 12th. My rider was disappointed in his post race interview, but I felt like I did pretty well for my first attempt. Players can enjoy a single race or they can enter into a championship mode and take on a full circuit of races. The final mode I explored was time trials. This mode just allows a player to explore a track alone, and compete against themselves to get the best times. I can see it being a great way to get to know each track before diving into championship mode to take them on during races. Once again I was surprised by the pure amount of arcade fun I was having. I didn’t feel punished for my mistakes, and I felt like even after just ten minutes, I was getting pretty good. And I can definitely see spending a lot of time with the track editor trying to create legitimate tracks, and ridiculous ones featuring nothing but jump after jump. A big part of that is that this game also features a rewind function similar to GRAVEL. If you mess up or wipe out, you can wind time back to the moments before and try again. It’s nice not to feel like one mistake destroys an entire race. I definitely enjoyed my time with Monster Energy Supercross. It’s fun, it looks great, it feels great, and there is a lot of customization available for the bikes and riders. Fans of racing games will get a kick out of how smooth and well built it is, and even complete newbies will be able to pick it up and have a great time. 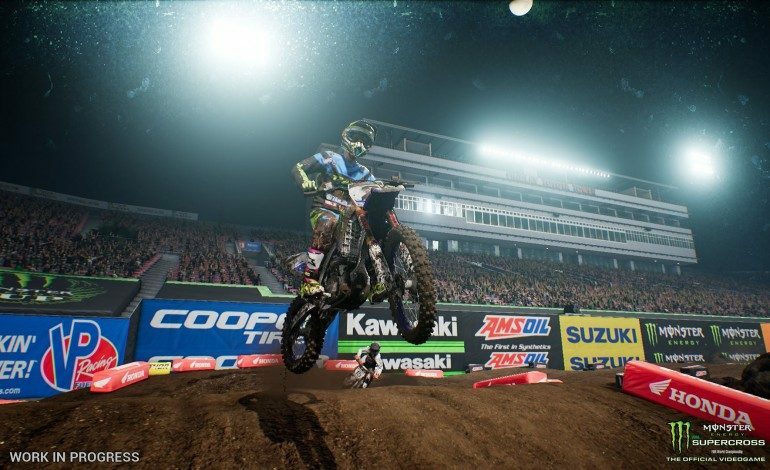 Monster Energy Supercross: The Official Videogame comes out on February 13 for Xbox One, PS4, PC and will release shortly after for the Nintendo Switch.